My Algebra 2 students have traditionally struggled with identifying which parent function goes with a graph or a table of data points. Last year, I had the bright idea to start off the year with parent functions. That failed. Miserably. This year, I've saved them for the end of the year. This has worked better. Or at least I think it has. I'm still not sure it's ideal. 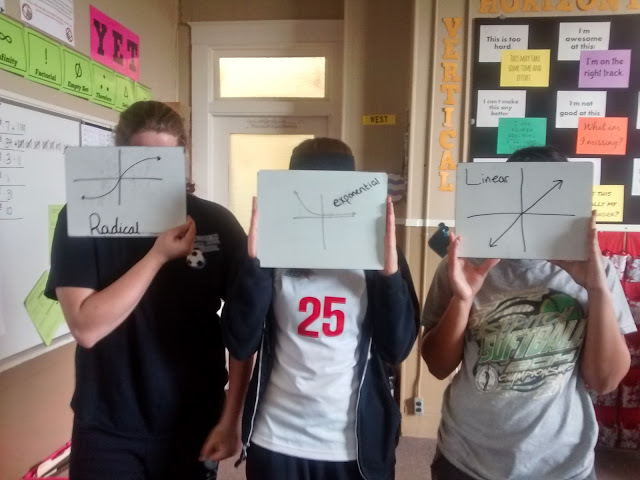 This week, my students took a quiz over recognizing parent functions given an equation, a table of data points, or a graph. In order to get them to review the basic shape of each parent function, I decided we should play a game of Two Truths and a Lie. I was inspired by this blog post by Jon Orr. The premise is simple. Have students create two true statements and one false statement. Challenge them to try to trick their fellow classmates. I used the groups they were seated in as the groups for this activity. Each group got three dry erase boards. 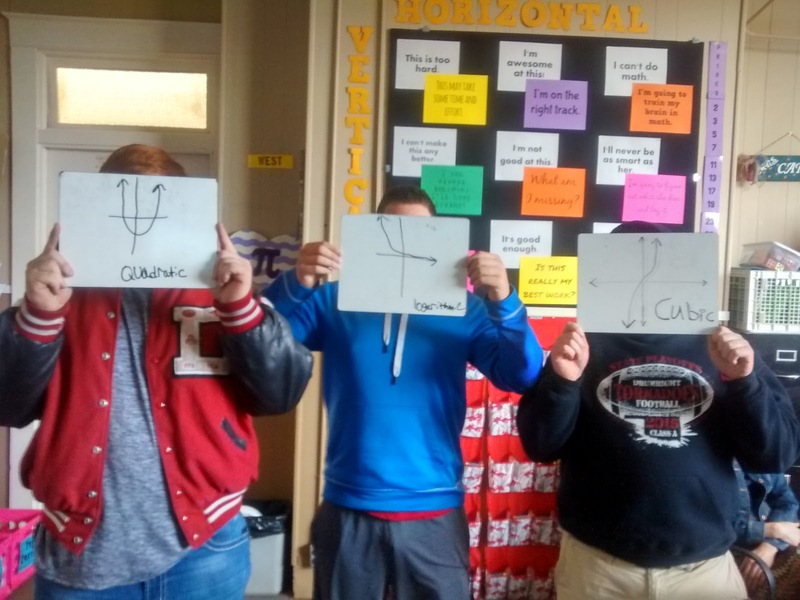 On each dry erase board, they were supposed to draw a function. Then, they were supposed to label the functions with the parent functions they represented so that two were true and one was false. After working for a few minutes, the groups took turns standing up and presenting their boards to the class to determine which were truths and which was the lie. The kids took it in a direction I didn't quite expect and started saying things like "Sally is a liar! You're a liar, Sally!" Things got QUITE personal. But, it did mean my students were engaged which is something to be thankful on the second day back from Spring Break! Must do this more often because it really took ZERO prep time. I did end up having to make up an example on the SMARTBoard to get kids started. I'd love to find a way to incorporate this into every unit we study. I'm finding there's great benefit from repeating the same practice structure throughout the year. This is something I really want to focus on this summer. Continuity with practice structures will mean less wasted time and hopefully less student frustration. So, building on that, does anyone have a comprehensive list of practice structures for the math classroom? I've been meaning to make a list myself, but it hasn't happened. YET. Definitely agree about wanting to reuse practice structures--especially the really good ones. Let me know when you find that list of really good ones! Will do. I'm thinking of crowd-sourcing it. 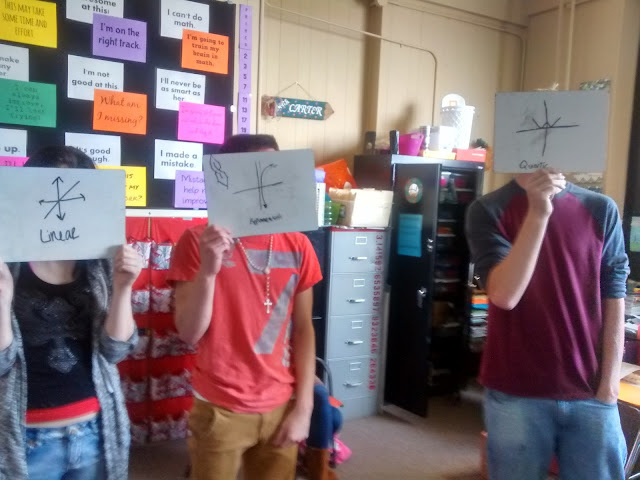 I use Kagan Cooperative Learning structures in my math classroom for practicing skills in each unit. And you are absolutely right...once your students understand the format of each structure. the practice sessions become seamless. I need to get out my Kagan books this summer and really study them. I've used Kagan strategies every once in a while, but I know the power comes from using them over and over so students become familiar with them. So... I teach resource math, co-teach and ESOL sheltered math. Every time I try to reuse a review activity from the previous unit, my kids start "not that again" unless it's Kahoot but Kahoot only works (for me) for DOK 1 (basic recall) questions. I spoke to a reading teacher about teaching vocabulary and I feel like I have tried everything in 6 years (Frayer models, student created flashcards, teacher created flashcards, discretely teach vocab after the word appears, teach vocab as the word appears in our work, all with weekly cumulative vocab tests) her suggestion was to never do the same vocab activity in a 9 weeks. Is vocab a different part of the brain? Is that why I struggle so much? Thoughts? Other suggestions? This is great. I actually have been working on a similar blog post and decided that it would be worthwhile to see what's out there and found this. Great job. I'll include a link to your post if that's ok with you.